As an attorney in private practice in Los Angeles County, California William Hayes provides extensive estate and tax planning services to individuals and businesses in Los Angeles, Pasadena, Glendale, Burbank and surrounding communities. Attorney Hayes’ primary focus is to help clients avoid probate, protect their assets, and provide for the security of their loved ones with a well-crafted estate plan. He believes in giving each client the time needed to explain his or her needs and wishes and then dedicates his efforts toward making the client’s desires clear in their final estate plan. Clients of The Hayes Law Firm have often commented upon the warmth and friendliness they experience while at the firm because Attorney Hayes strives to provide an office environment where clients feel comfortable as they go through the very personal process of planning for the care, maintenance and distribution of the assets which they have spent a lifetime accumulating. Indeed, the proper, custom-tailored planning and administration of his clients’ estates is just as important to him as it is to the families it affects. Attorney Hayes is aware of the growing importance of estate planning and as an active member of the Los Angeles County and Pasadena community, dedicates part of his time to educating the public about the importance of planning for when they’re gone or unable to care for themselves. Consequently, Attorney Hayes speaks throughout Los Angeles on the topics of estate planning, business planning, and asset protection on behalf of many civic and community organizations, non-profits, churches and social groups. In addition, he has had speaking engagements sponsored by well established banking institutions, insurance companies, and financial services groups. In addition to his busy practice helping clients secure the peace of mind that comes from having a well-crafted estate plan in place, attorney Hayes is a volunteer for the Los Angeles Superior Court Conservatorship Program and is an authorized speaker throughout the Los Angeles area for the California State Bar on estate planning subjects. He is the author of the Contracts, Business Entities and Trusts section of the book, “Wealth Is Possible” by financial planner and church bishop, Rick Johnson and a member of the exclusive American Academy of Estate Planning Attorneys. 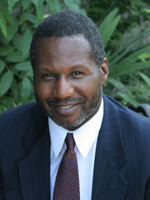 Attorney Hayes earned his Juris Doctorate degree from the University of California, Los Angeles, where he was a member of its prestigious and selective Law Review as well as a member of the Moot Court Honors Program. As a Senior Editor of the Law Review, he published a well-received article entitled, “Jury Selection and the Equal Protection Clause”. While in law school, he also gained national recognition for a private interview that he conducted with the late United States Supreme Court Justice, Thurgood Marshall. Attorney Hayes lives in the Los Angeles area with his wife Pamela.